These cosmeceutical products treat wrinkles, uneven pigmentation, acne, acne scars, blemishes and sun damaged skin. They can be combined with dermabrasion for enhanced results. The Jan Marini range contains ingredients which stimulate skin renewal without irritation to the skin. As well as a range with glycolic acid, and they also offer glycolic acid peels. 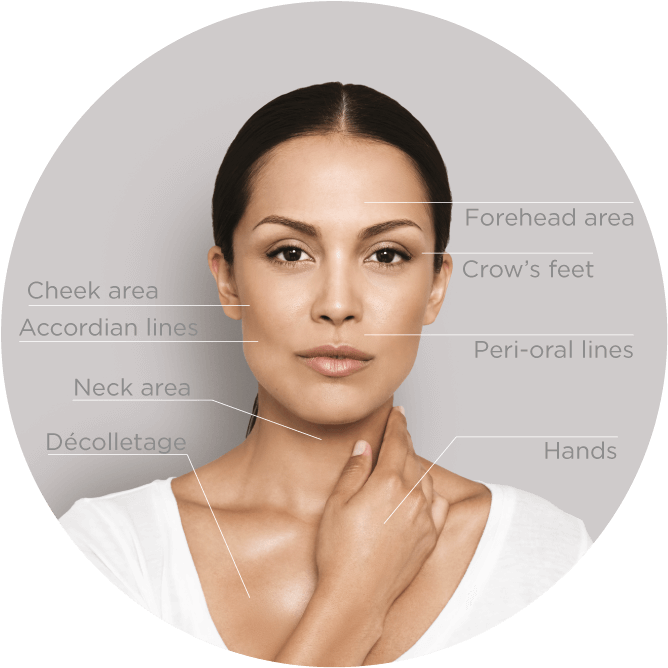 Restylane is made from non-animal sourced hyaluronic acid (NASHA technology) in Sweden by Q-Med. Hyaluronic acid is a constituent of all our cells and is made up of sugar and water. It works by drawing water to itself so plumping up fine lines and wrinkles. There are different weights for different areas of the face. It is used for adding volume to the cheeks as well as treating ageing hands. Teosyal is a hyaluronic acid-based product from anon-animal source made by Teoxane in Switzerland. It plumps up the fine lines and wrinkles giving the face a more natural rounded look. There are different weights for different indications on the face and it is also useful for adding volume and remodelling cheekbones. The effect is immediate and there is very little downtime. A new concept treatment between filling injections and mesotherapy, which redensifies your skindeep down and restores its ability to reflect light. This innovation guarantees a uniform and totally natural result. The perfect solution if your complexion is dull, or you have dry skin with wrinkles appearing. Skinboosters injectable gel is an innovative treatment that improves your skin condition. It reduces very fine lines, smooths and softens the skin, and increases its elasticity making it look less tired and worn. A course of two or three, two-three weeks apart is recommended and improvements in skin quality can be seen up to 12 months. In order to keep this up regular maintenance every six months is advised.